In 2016, the number of people in need of international humanitarian assistance reached over 164 million. While recent reports reveal that in the same year the total value of official humanitarian assistance grew by 6%, the global shortfall of unmet needs remained stubbornly at 40%1 . To make real progress in closing the gap we must recognise that our current system is failing to evolve at the pace and scale needed. Addressing this shortfall, however, is not simply a matter of money. Major gaps exist in the evidence base and the innovative capacities underpinning humanitarian action. Realising a humanitarian system that is truly anticipatory and fit for purpose in responding to crises, requires us to urgently build more effective alliances within and between communities of science, research and innovation. 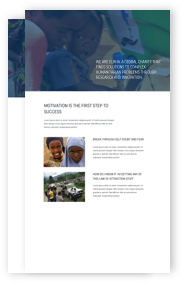 This is why Elrha has launched the Global Prioritisation Exercise for Humanitarian Research and Innovation (GPE) a new global effort to transform the impact of research and innovation in the humanitarian system. The GPE aims for the first time to provide public visibility of the range of global investments, capacity and activity in humanitarian research and innovation and to widely consult and identify shared priorities for further investment and action. The global mapping presented here is the essential first step in this process. The report provides us with a detailed baseline of global humanitarian research and innovation activity as viewed through published outputs during 2016-2017. The data presented reveals not only the range of thematic, technical and geographic focus of activity during this period, but also maps the numerous Funders and Actors active in this space. These early results raise important questions regarding how well current investments and activity align to recognised humanitarian priorities and needs, and reveal interesting differences between the focus of research and innovation communities. The data also shows a marked disparity between the geographical locations of funding recipients compared to the geographical focus of the research and innovation activities themselves; with the vast majority of research and innovation resources both provided and received by actors in the ‘Global North’. This important finding suggests that more needs to be done to shift funding allocations to partners closer to where humanitarian needs are most directly experienced. This baseline report represents Phase One of the GPE, and provides us with the foundation to develop the next two phases of our work. 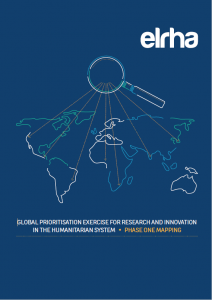 Guided in part by the results of this report, the second phase of the GPE will be a global consultation with key stakeholders in humanitarian research, evidence and innovation, to identify shared priorities for research and innovation action and investments. It will consist of detailed conversations with a geographically diverse group of stakeholder actors, including: Governments, International Organisations and Humanitarian Actors; Humanitarian research and innovation communities; Communities affected by crises; Private sector actors. In addition, the Phase Two consultation offers the potential to explore a more detailed financial analysis of funding volumes between donors, which was beyond the scope of this current report. The first two phases of the GPE will culminate in a new strategic framework for current and new funders of humanitarian innovation and research, to be presented in Phase Three of the initiative alongside a programme of dissemination, advocacy and outreach. As part of our ambition to provide the GPE as a regularly-updated, sustainable, resource for the humanitarian community, the mapping methodology developed to enable this report provides us with a valuable tool for monitoring and tracking progress and trends over time. For questions or more information about the Phase One Report and data, please contact us. Elrha would like to thank Global Emergency Group (GEG) for their tireless and comprehensive effort in the preparation of this report. This mapping exercise would also not have been possible without the generous support of the UK Government (DFID) and the Global Alliance for Humanitarian Innovation (GAHI).